This cake and the matching first communion sheet cake go great together for First Communion Cakes. But if you do not need that much cake, you can just make one or the other. Bake a cake in the cross cake pan. Ice with white icing using a cake spatula and making it nice and smooth. 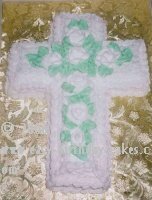 Use white icing and round tip, size #5 and do the lacework on the sides and the beveled edge of the cross. Do not do the lace work on the flat top. Change your tip to a star tip, size #16 and make a shell border on the bottom edge of the sides and the to[ edge of the sides and the top edge of the beveled sides. Make roses with a large rose tip. Place them on top of the cross. Make leaves around the roses using a #352 leaf tip.